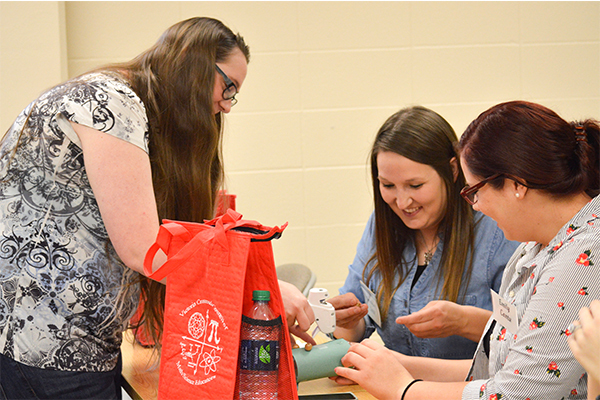 Eliza Dodds of Victoria, left, shows Shiner resident Katelynn Leist, middle, and Emily Cantu of Corpus Christi how to create a visual aid Saturday as part of a math and science lesson presentation during the Victoria Crossroad Council for Mathematics/Science Educators Conference hosted by the UHV School of Education, Health Professions & Human Development. All three of the women are UHV students and pre-service teachers. Dodds is pursuing a Bachelor of Science in Interdisciplinary Studies in early childhood to sixth-grade education, and Leist and Cantu are earning their BSIS degrees in fourth-grade to eighth-grade education. The event was attended by 85 educators and students, and offered 44 different presentations by UHV pre-service teachers, who will graduate in 2019.